+ Figure 19. Effect of the alkyl chain length in CnMeIm Tf2N on Sr2+/Na+, Sr2+/Cs+, and Sr2+/K+ selectivities during metal cation extraction from aqueous solutions with (top) DCH18C6 (0.1 M) or (bottom) N-octyl-aza-18-crown-6 (0.1M). Reprinted with permission from Ref. 526. Copyright (2004) American Chemical Society. /aqueous solution (solid symbols) or dodecane/aqueous solution (open symbols). 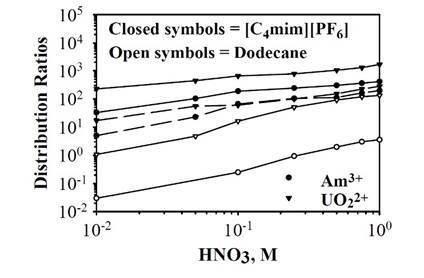 The extracting phase is either (- - -) 0.1 M octyl(phenyl)-N,N-diisobutylcarbamoylmethyl phosphine oxide (CMPO) in n-BuMeIm+PF6- or (–––) 0.1 M CMPO + 1 M tri-nbutylphosphate (TBP) in n-BuMeIm+PF6-. Reproduced from Ref. 534 with permission of Elsevier Ltd. The high level waste resulting from the treatment of spent nuclear reactor fuel also contains actinides that must be eliminated from the processing solution. Chemical extraction experiments have been conducted to remove actinide cations using imidazolium-based RTILs with octyl(phenyl)-N,N-diisobutylcarbamoylmethyl phosphine oxide (CMPO) and tri-n-butylphosphate (TBP).534-536 The CMPO works as an extractant, and the TBP is a phase modifier. As shown in Fig. 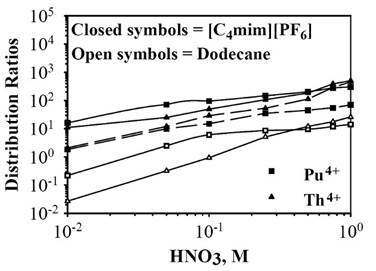 21, the distribution ratio increases with the HNO3 concentration independently of the solvent and obviously improves by the use of a RTIL in comparison to a conventional dodecane-based system. RTILs,363,364,385,386,537 probably because the solubility of the actinide salts is much lower in these solvents. To overcome this issue, the synthesis of actinide complexes consisting of organic cations and actinide chloride anions have been attempted.363,364,538-540 Undoubtedly, more research on this subject will appear in the near future.